The Windy Arbor Primary School in Solihull has undergone refurbishment and vertical bar metal railings manufactured and installed by Alpha Rail have helped transform the appearance of the school. The school was identified to undergo an extensive remodelling programme as part of the £70m North Solihull Primary Programme Strategic Plan. The programme intends to replace 15 Junior and Infant schools with 10 newly built or remodelled primary schools. The North Solihull Partnership (NSP) is overseeing the delivery of this programme alongside and on behalf of Solihull Metropolitan Borough Council (SMBC). The strategic plan is part of the councils’ commitment to leading a programme of change focused upon improving educational standards. Main contractor Interclass PLC, appointed Alpha Rail as a sub-contractor to supply metal work. The architectural drawings included the requirement for boundary railings and entrance gates to be installed around the perimeter of the school site. In total, 60 linear metres of 1800mm high decorative vertical bar metal railings were installed along the East and West boundaries of the school running adjacent to Chester Road and Brook Farm Walk. 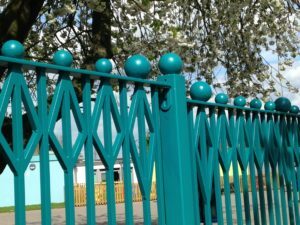 These railings were supplied hot dip galvanised and polyester powder coated RAL 5021 turquoise. Further bespoke decorative effects included diamond shapes at the top of the vertical bars and ball top finials. Alpha Rail also manufactured a double leaf entrance gate and two further single leaf pedestrian access gates which were supplied polyester powder coated RAL 4005 Purple. The gates enabled safe pedestrian access in and out of the school and ensured access was restricted to authorised users.